Comments: George Walker Gilmer volunteered as a Private in Company C, 2nd Virginia Cavalry on June 16, 1863. 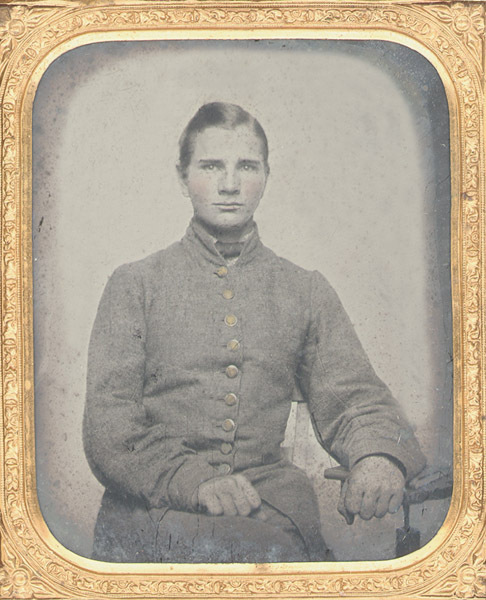 As was often the custom of those war days, George had his photograph taken on the day he joined the Confederate Army. He went off to battle and served with great valor. George was twice severely wounded and lost an eye at Gettysburg. The commanding officer of the 2nd VA Cavalry, Colonel Thomas T. Mumford, noted that George was distinguished for gallantry and devotion to duty. Mr. George Walker Gilmer volunteered as private in Co. C., 2nd VA Cavalry on June 26th, 1863, in the 18th year of his age. Was in several sharp skirmishes in and also with (illegible) at the burning of Carlisle, PA on the 3rd of July at Gettysburg. He was wounded twice, both serious wounds, one in the right shoulder by a shell; the second wound in right temple (resulting in loss of right eye) was caused by a miniball which was extracted by Dr. Burerette of Washington, DC, in the winter of 1897 more than thirty four years after the wound was rec'd. When our army retreated, Mr. Gilmer's serious wounds caused him to be left behind & he fell into the hands of the enemy & was taken to David's Island prison where he received great kindness from surgeons & southern ladies living in N. York City, who had charge of the wounded. He was exchanged in the fall, though unable to sit up in his bed. On the following April, however, he volunteered again & was made courier for Gen. Wickham, & was in the Spottsylvania C.H. & Yellow Tavern & some of the hottest fights of the campaign of 1864. Late in the summer, however, the yet unhealed wound in his eye, was so seriously affected by the heat & excitement that he was honorably discharged as unfit for service. The following spring, he again left home to join Col. Mosby & was with him till Gen. Lee surrendered. Gilmer, George Walker Pvt., Enlisted June 1863 in Co. C, 2nd VA Cav. WIA (shoulder) and captured at Gettysburg. Exchanged after 3 months in prison at David's Island, N.Y. Courier for Gen. Wickham in April 1864. Involved in battles of Spotsylvania C.H. and Yellow Tavern. Joined the 43rd VA. Cav. in early 1865. After the Confederate Army surrendered at Appomatox in 1865, George Walker Gilmer returned home to farmlife near Scottsville. He married Frances Harrison Brown (b. 1848), and they became the parents of six children. 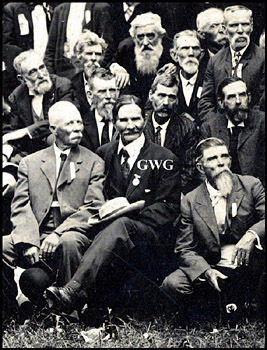 George became a member of Scottsville's Henry Gantt Camp of United Confederate Veterans. He is shown at right during the 1908 Confederate Veterans Reunion in Scottsville. George Walker Gilmer died on August 13, 1918, and is buried in the Gilmer Family Cemetery at Mt. Ayr, Albemarle County, VA. The 1863 photo of George Walker Gilmer is part of the Phillip McCoy collection; Mr. McCoy resides in Kentucky and is an avid Civil War enthusiast and friend of Scottsville Museum. The 1908 photo of the Confederate Reunion at Buckingham Courthouse is part of the Raymon Thacker collection; Mr. Thacker resides in Scottsville, VA.